On each return visit to London, it’s always the same. I step off the Heathrow Express in Paddington Station. Jet lagged and groggy, I grab a coffee and make my way to the cab stand. I collapse in a heap in the spacious seat of my black cab. My driver gives me a warm greeting and without fail regales me with entertaining stories and odd bits of London history as we cruise through the city’s streets. 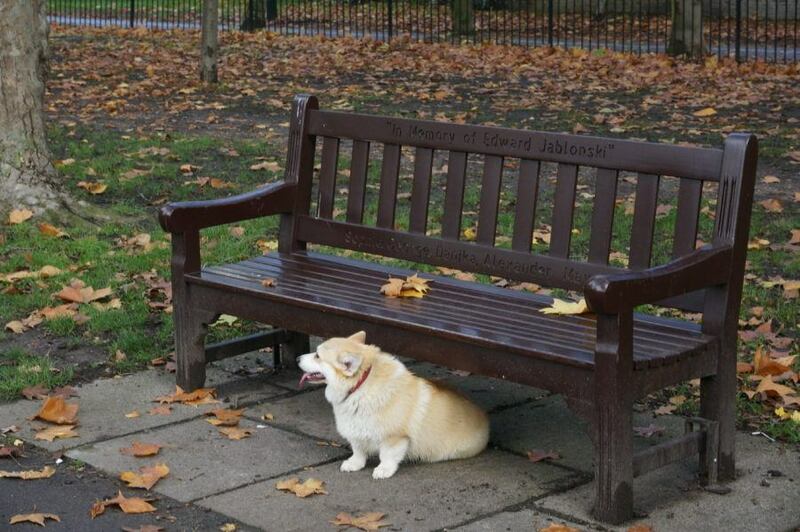 Each landmark we pass (Hyde Park! Fortnums!) gives me a tiny rush of excitement. There is something about London– the mix of old and new, the big city feel and village-like mews– that makes me come back again and again. It’s the one city I’ve visited most, but never tire of (as Samuel Johnson says, “when a man is tired of London he is tired of life”). As a New Yorker, I should be bragging that the New York city subway runs all night and costs next to nothing, but my heart lies with the London Tube. For starters, instead of naming its lines after boring numbers (my local trains are the 4,5,6), tube lines have charming names like Jubilee and Victoria. And while the Tube does close down late night, I’ll take the inconvenience for near spotless trains and stations (an adorably named cleaning crew called “fluffers” polish the tube top to bottom each night). 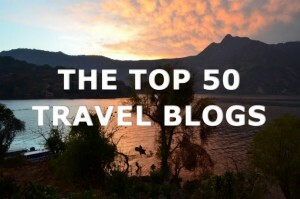 For more read about my love for the Tube (and buses and black cabs) in this post. I love London’s Sloane Square tube station. 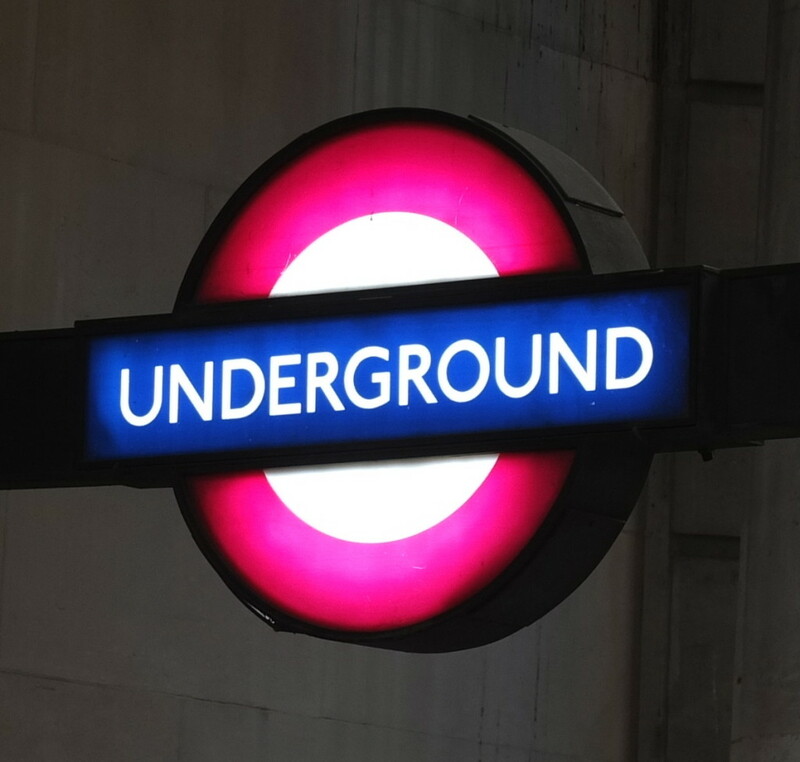 How to remember the Tube experience? One of my favorite shops in all of London is the London Transport Museum Gift Shop. The shop incorporates the moquette fabric you’ll find on subway seats into bags and pillows. Or pick a soft scarf with all the colors of the tube lines. 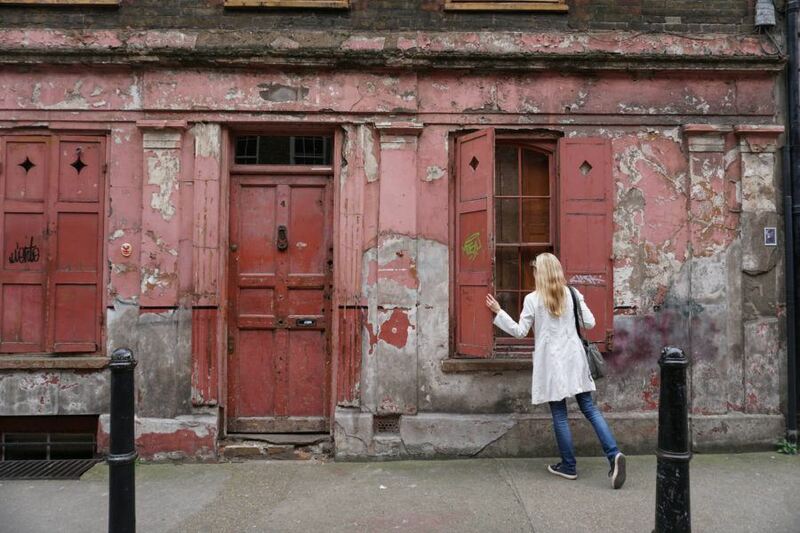 Think London is all grand, regal buildings and old traditions? 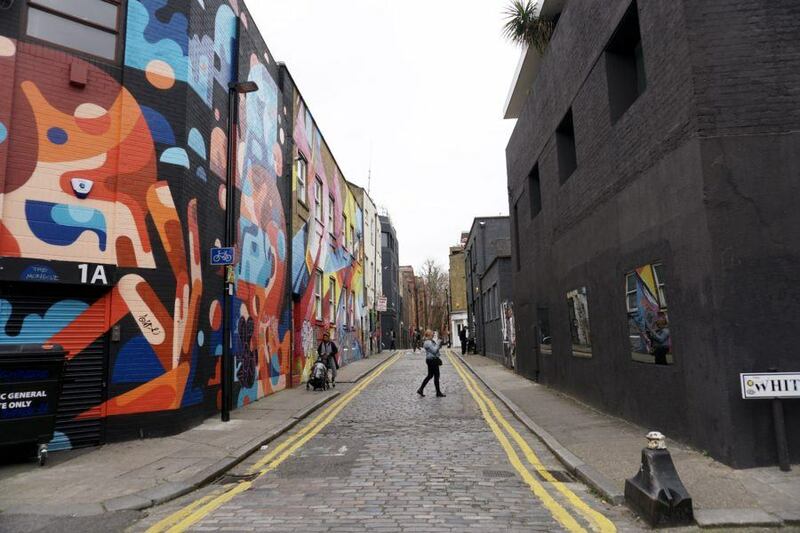 Visit the Shoreditch neighborhood to get a taste of London’s edgier side. Converted warehouses, walls of murals, art galleries and gastro pubs all blend in perfectly here. Wander down some side streets for some picture perfect shots like this one below. My favorite building front in Shoreditch. 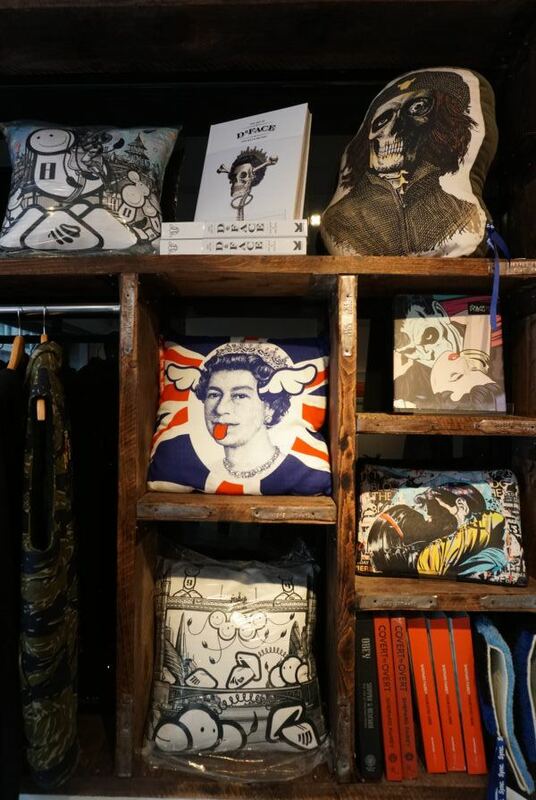 Gallery shops in Shoreditch have a range of art-inspired gifts and souvenirs to choose from. Art prints are nice, but then you have to get them home and frame them. Something that just never seems to happen for me. Now these artist pillows, on the other hand, are ready to go, no fuss required– and would add just the right cheeky touch to my sofa. 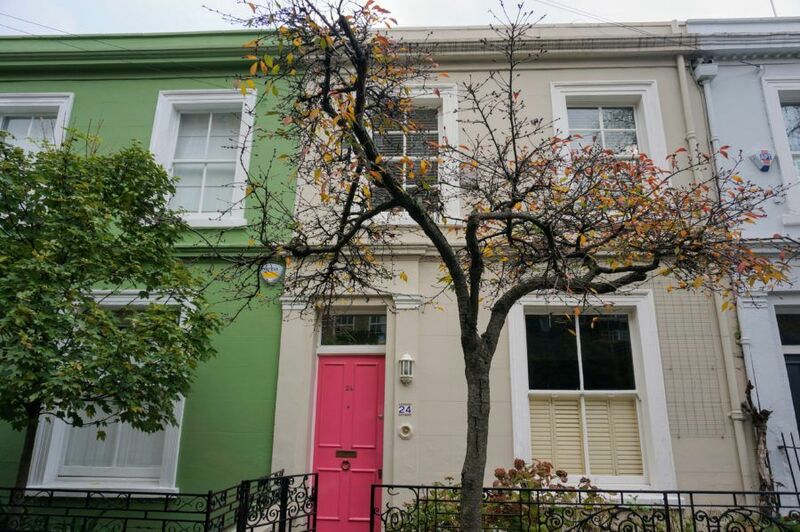 Like most Americans, I fell in love with Notting Hill after watching the romcom Notting Hill. While it took me years to actually get there, when I did, it was even better than in the movie. I was absolutely taken with the colorful pastel homes and shops here, delightful to walk through and if you’re a photo buff, amazing to shoot. Look for a full post on Notting Hill soon. 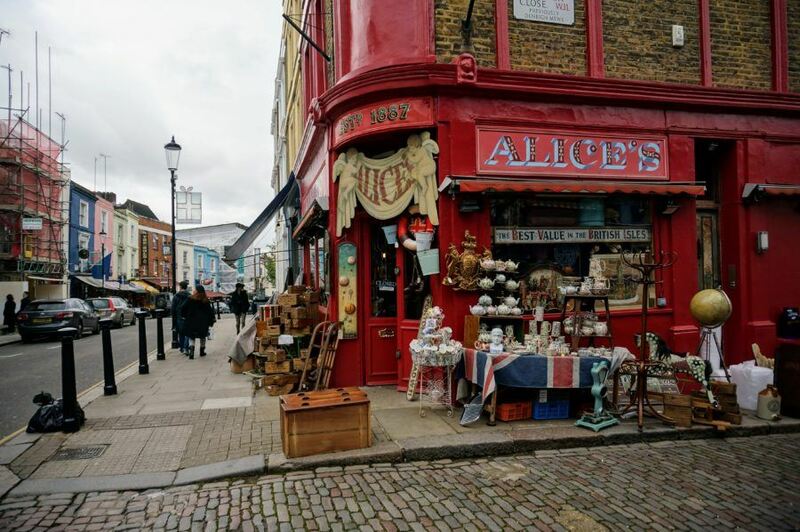 Notting Hill is best known for its weekend Portobello market, but most visitors aren’t aware that even on non-market days, the streets still have a market like feel to them, with shops spilling their wares out front. As a bonus, it’s infinitely less crowded on non-market days and the perfect time to trawl for fun vintage and antique items. Notting Hill is perfect for aimless browsing. The British have perfected tea and scones, there really isn’t much more to say about this. There are different types of tea to sample, from a full blown afternoon tea complete with finger sandwiches and fancy pastries to a simple cuppa. 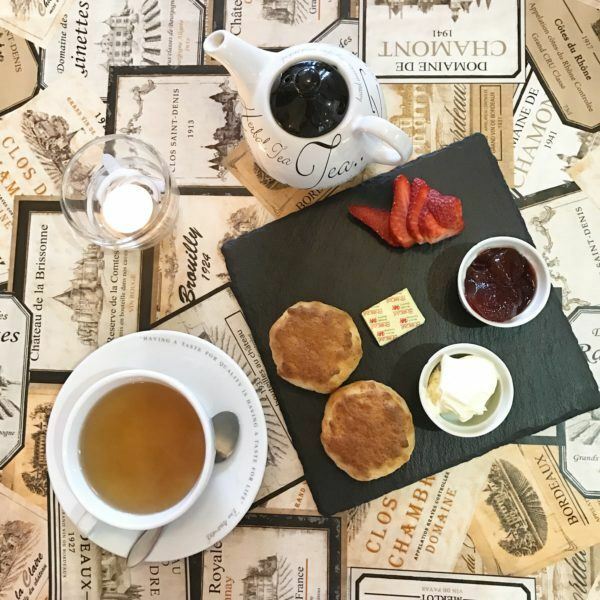 As I’m usually too short on time to sit for a full tea, my preference is for a cream tea– a pot of tea served with fresh baked scones, Devonshire cream and jam. Many hotels, some restaurants and most of the department stores offer a cream tea (my go-to spot is at Liberty of London). What a proper British cream tea looks like. In London you won’t be hard-pressed to find fine porcelain tea cups, tea pots, tea cozies and tea towels. And then of course you have the tea itself– I usually bring some fancy tea home from Fortnum & Mason along with some supermarket brands (I like PG Tips, aka “the builders tea”). Fortnum and Mason has stood on the same ground at 181 Picadilly in London for over 300 years. Known by locals as “Fortnum’s”, it has many of the same cultural benefits of going to a museum– after all, we go to museums to learn about history and culture and to look at interesting and beautiful things. 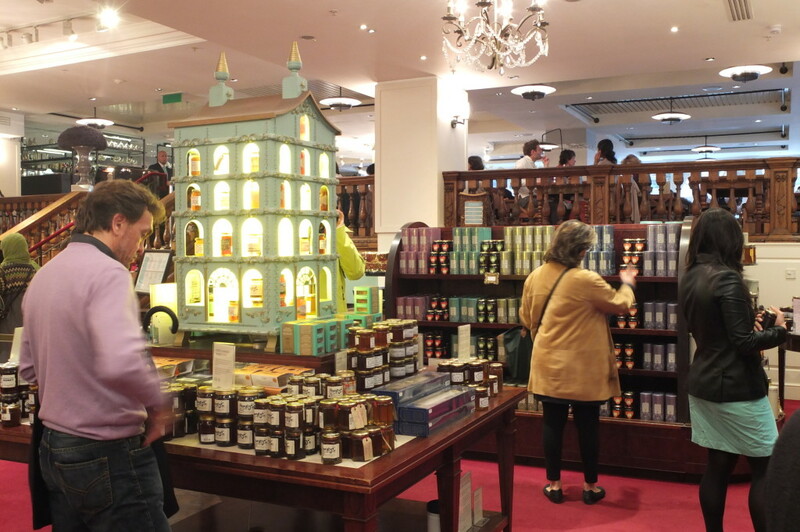 Fortnum’s has all of those things– but unlike a museum which only documents the past, at Fortnum’s history is alive in the walls of the store. 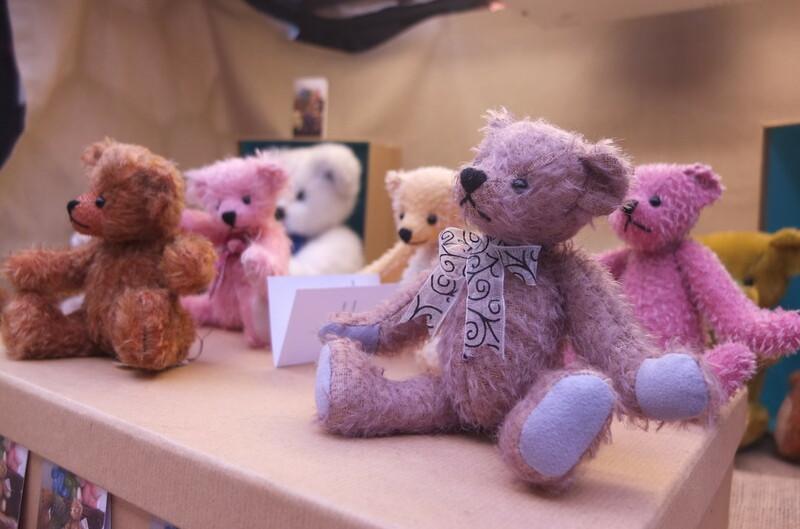 Originally a market food stall, it is now a full blown emporium to all things gourmet and British– from jams and teas to biscuits to unusual condiments like game relish. It’s great fun to browse here and I always leave with a full basket. 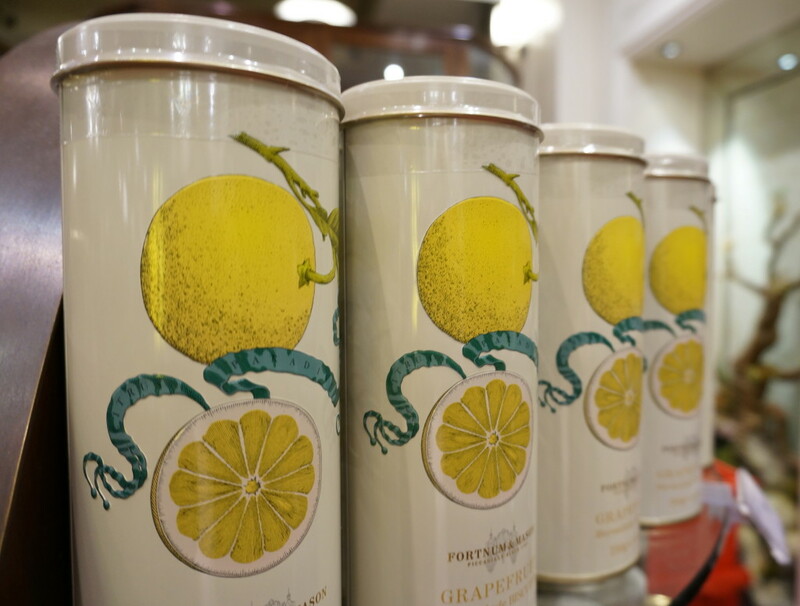 Read my full post on the delights of Fortnums here. I’m not sure which I’m more obsessed with– the actual buttery cookies or the beautiful tins they come in. Fornums has all flavors of biscuits, but sometimes I buy them for the color of the tin. Read about my biscuit tin hoarding problem here. Sure the Tower of London is best known as a place of torture and death, but despite the macabre past, it is one of the most fun-filled days in London. Stand in the same spot where heads have rolled, visit the mysterious ravens and of course gawk at the crown jewels. Set aside most of your day for a visit, you’ll need it. 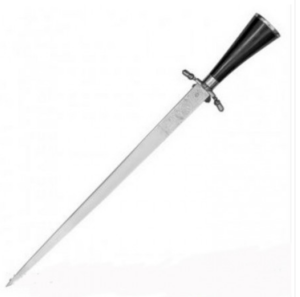 The Tower of London gift shop has all sorts of medieval items– my favorite was this replica Henry VIII hunting dagger– small enough to fit in a suitcase and interesting enough to be a conversation piece back home. London is a classic strolling city. Whether you’re finding hidden mews or ambling through one of London’s many parks (my favorite is Holland Park) make time to do nothing in particular except stumble upon your next favorite space. Do I look happy? Yup that’s because I’m doing my favorite thing in London, walking through adorable neighborhoods. Walking all day can be exhausting. 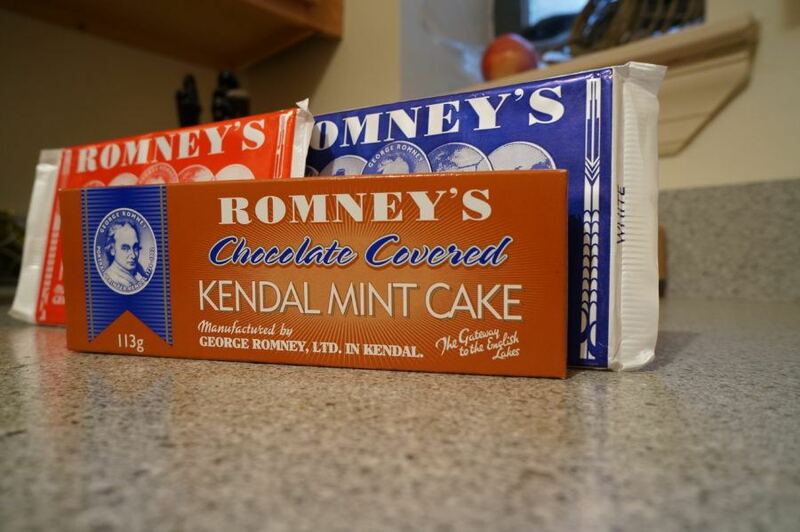 Fortify yourself with a Kendal Mint Cake, popular with hikers, and even brought on Everest expeditions by Sir Edmund Hillary. 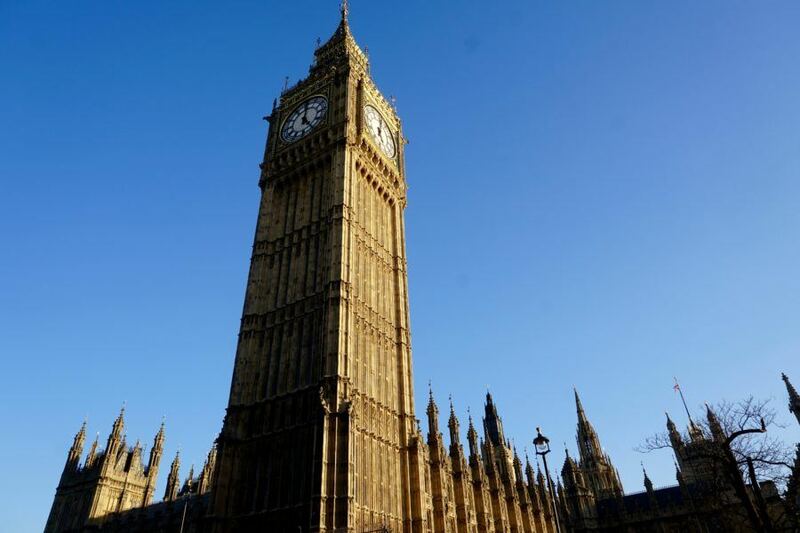 Explore London’s most iconic (and photogenic) attractions– Big Ben, Houses of Parliament and Westminster Abbey. 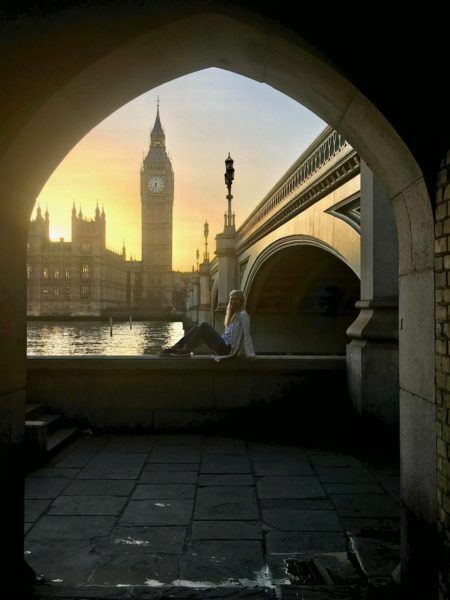 The great thing about visiting this area is it’s so easy to get to–hop off the Westminster tube stop and you’ll be standing right in front of Big Ben. Take a tour of the Abbey or just stand on the bridge and take in the sights. London is a city of icons. A cherry red telephone box. The unmistakable London Underground design. 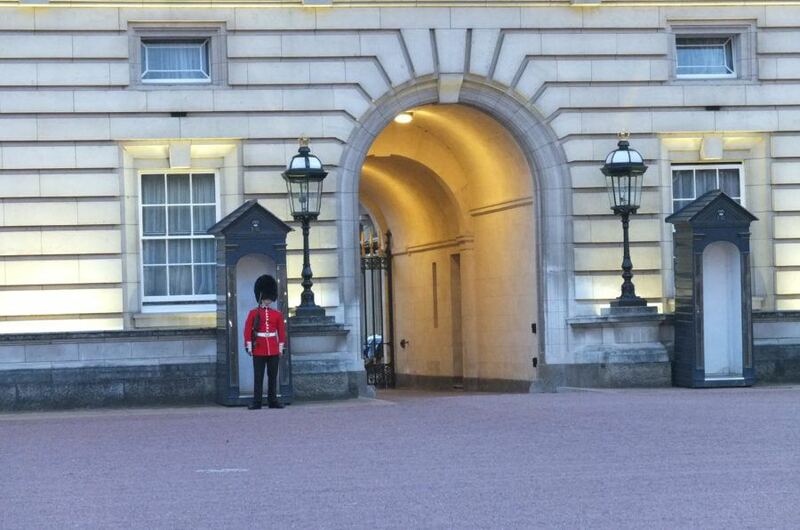 The Buckingham Palace guards in their furry bearskin hats. The towering Big Ben, still telling time the old-fashioned way. While I’m ordinarily not a fan of kitsch or tchockes, I lose my mind when it comes to anything that represents these quintessential British icons. Give me all the kitsch. I wrote about my obsession with British kitsch here. 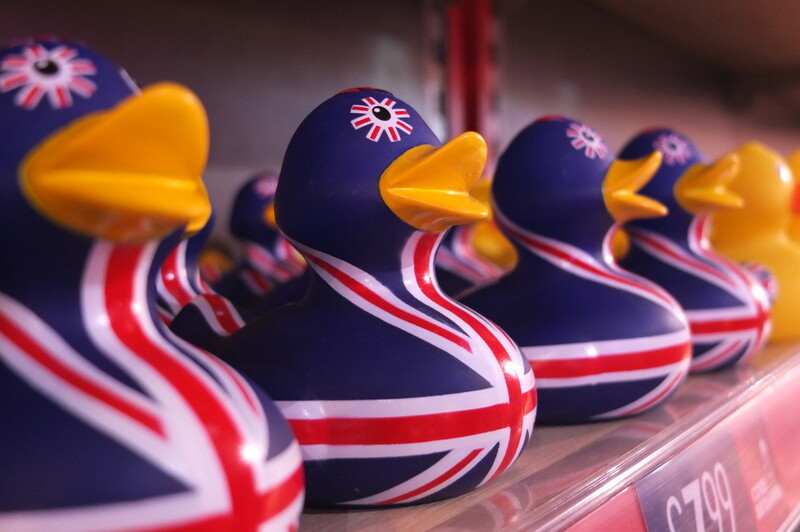 Rubber ducks emblazoned with the British flag? Yes please! Admit it– you always wanted to be a princess (or prince). Perhaps you aren’t shooting as high as second to the throne (spots are pretty limited after all) and a distant royal will do? For the girl or guy who loves all things royal, London– home of kings, queens, coronations and beheadings– is a fabulous place to visit. 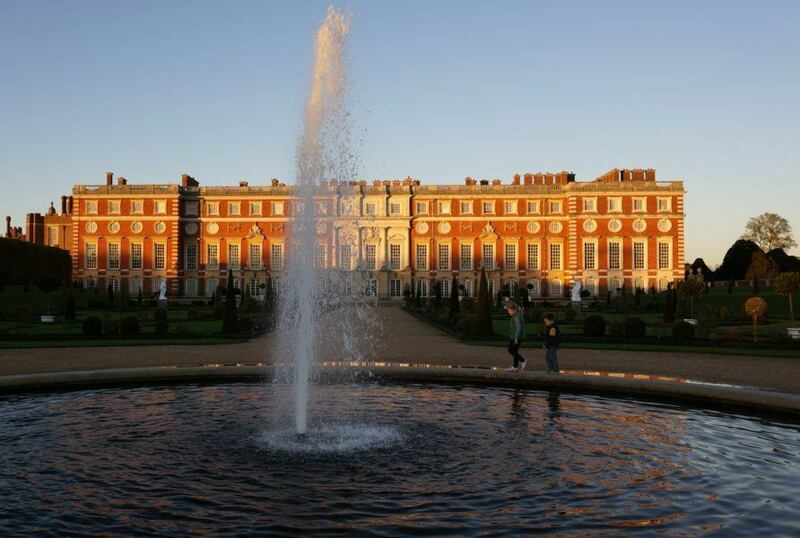 Buckingham Palace is of course a must, but don’t forget about Kensington Palace and Hampton Court– all well worth the time for a royal experience. 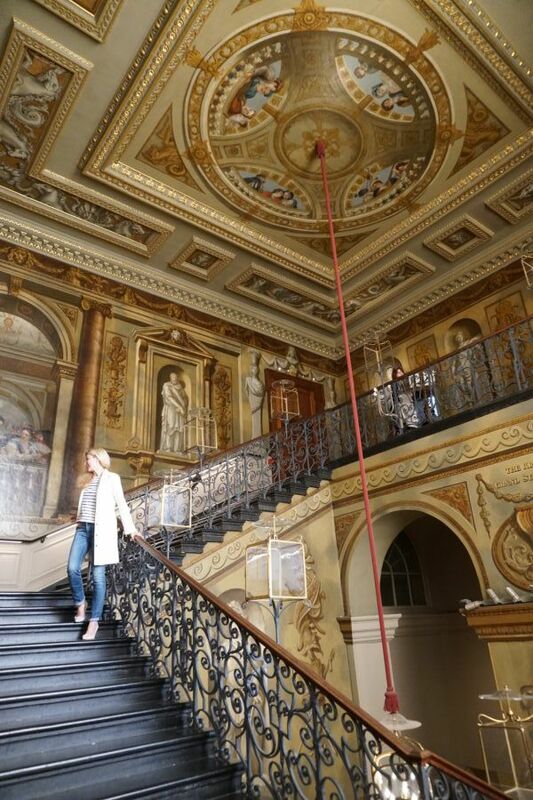 The grand stairwell at Kensington Palace. Hampton Court palace in late afternoon. 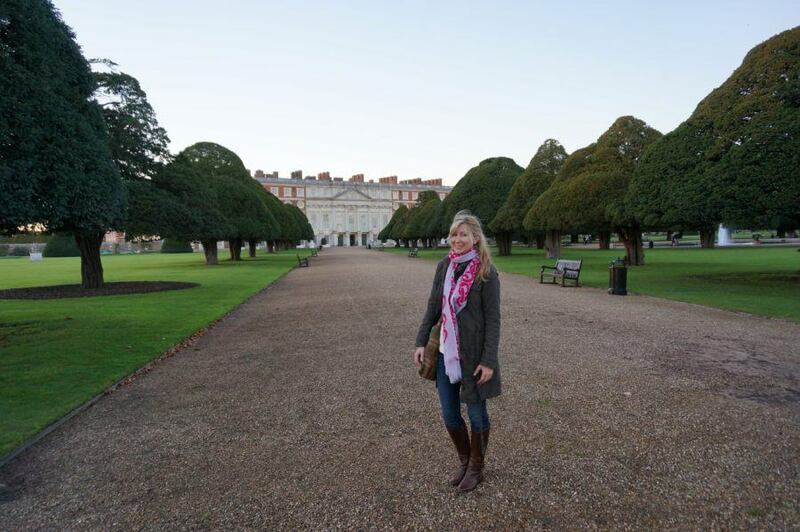 I loved the unusual trees at Hampton court palace. Buckingham Palace is a must for any first time visitor. Brave the crowds or go right before dusk for more elbow room. 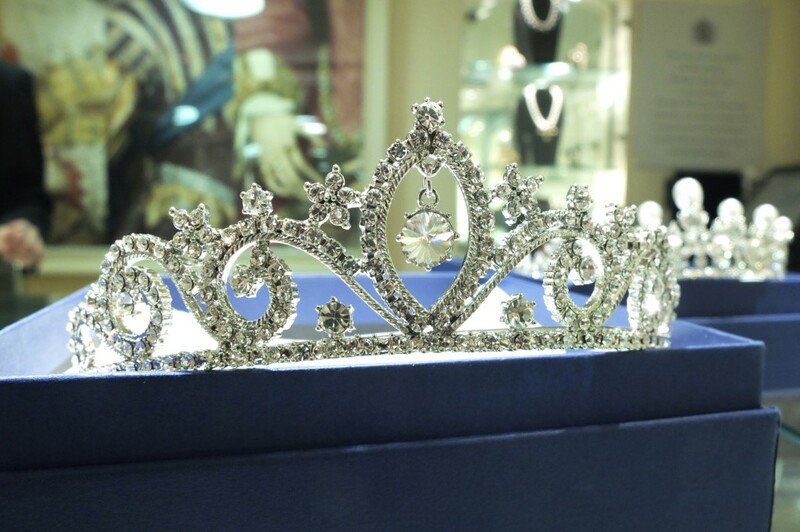 While all of the royal palaces have stellar gift shops and most feature similar items, my favorite is the Queens Gallery at Buckingham Palace, where you can bring home your very own replica tiara or a near exact copy of Diana’s engagement ring. Read my full review of the Queens Gallery gift shop here. Tiara anyone? At the Queens Gallery gift shop at Buckingham Palace. A more practical (sigh!) 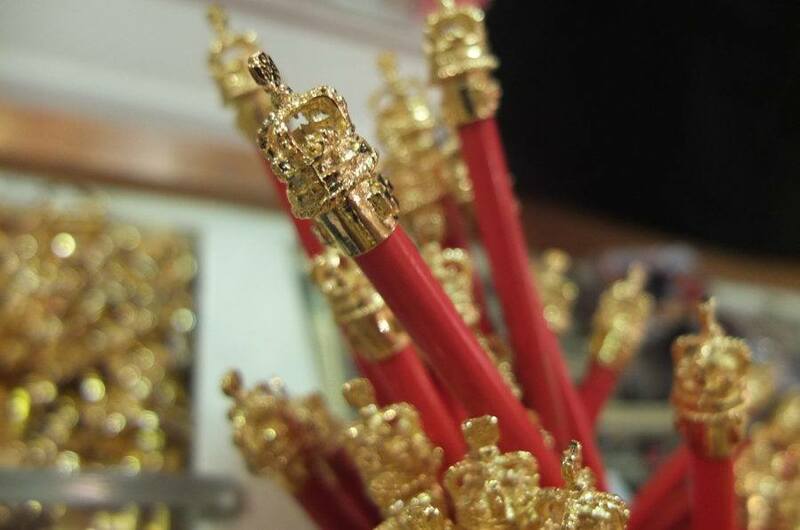 souvenir might be something like this crown topped pen. 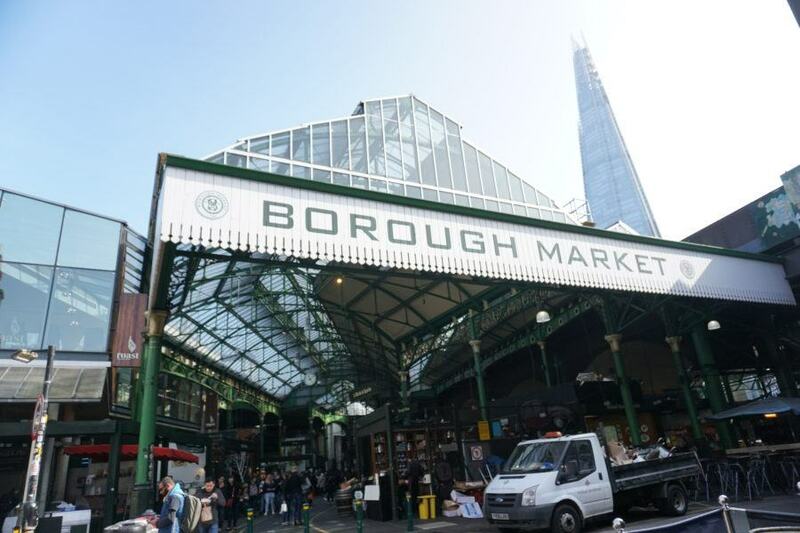 Borough market is not only London’s oldest market, but is also one of the world’s oldest trading hubs. Competition for vendor stalls is fierce, guaranteeing only the best and most unique stands thrive here. Come hungry and avoid weekends and lunch time if possible. 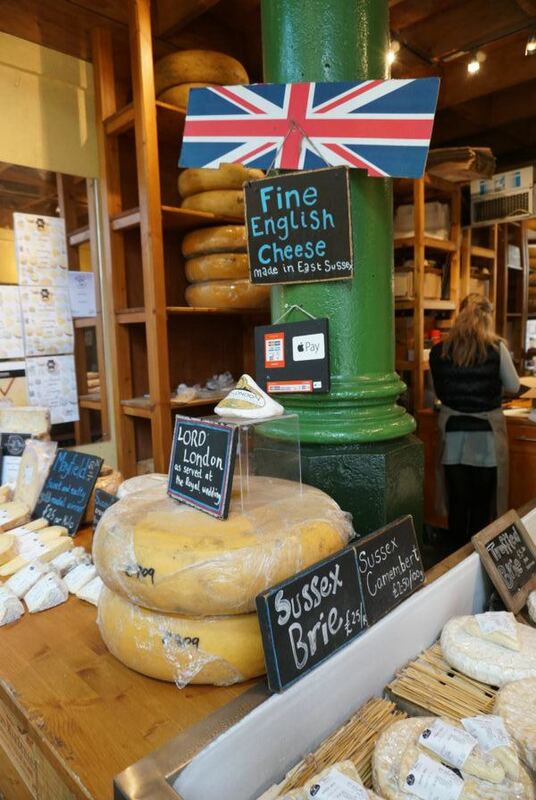 Borough market has many unique only-in-England food items, but my favorite thing to bring home is English cheese. Visit Greenwich to explore the Cutty Sark ship, stand on the meridian time line and be dazzled by the Old Royal Naval College. 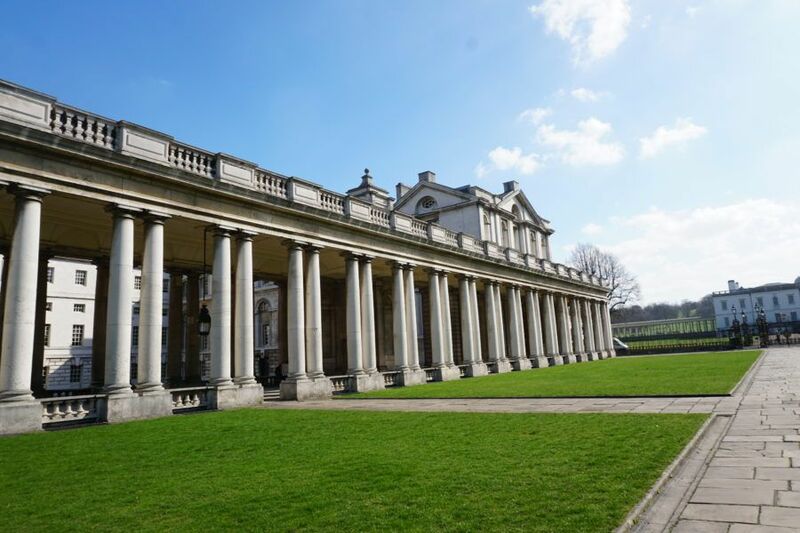 Then take a break from sightseeing and sprawl out on one of Greenwich’s impossibly green lawns with a picnic lunch. If you don’t mind checking a giant picnic basket, London is the best place to pick one up– complete with fine china, crystal and cutlery. Or for those who have to be slightly more practical, bring home a more practical, packable picnic set as I did. Read about shopping for picnic baskets here. Picnic set from Fortnum & Mason. 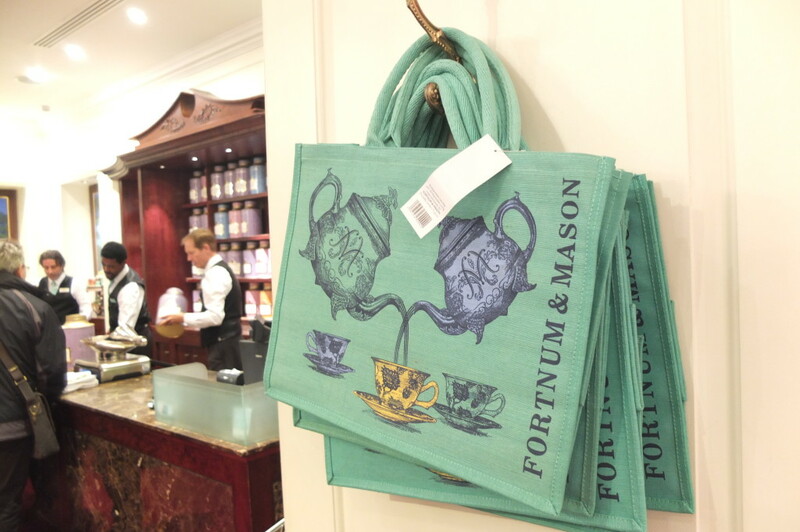 Fortnum & Mason has a huge selection of classic stocked picnic baskets. Back home I use my picnic set frequently. 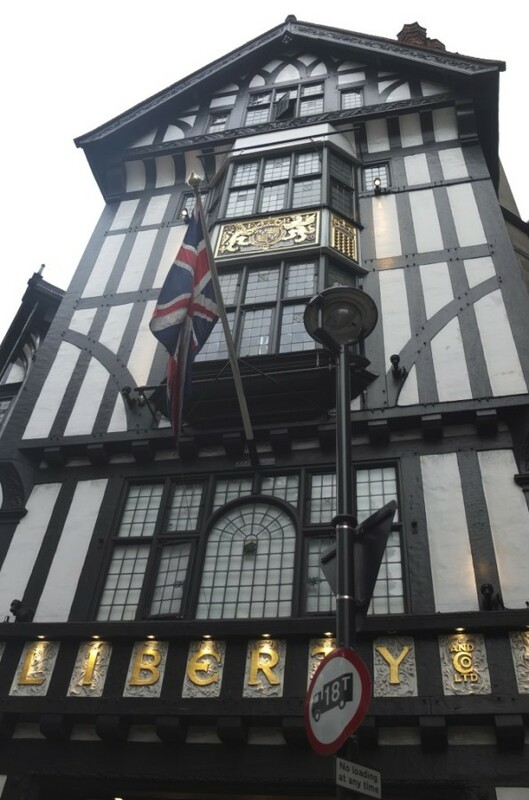 Liberty of London is completely different from any other department store I’ve ever experienced— walking through its cozy rooms, grand atriums and winding wooden stairwells feels like you are exploring the home of a grand English aristocrat. Read my post about Liberty of London here. 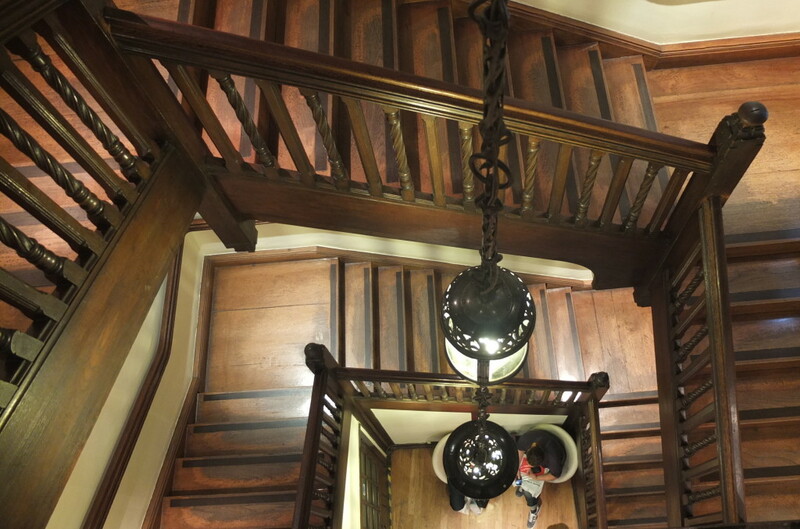 I would visit Liberty London just to walk up this creaky, near century-old staircase. You can’t miss Liberty’s iconic mock-tudor storefront. 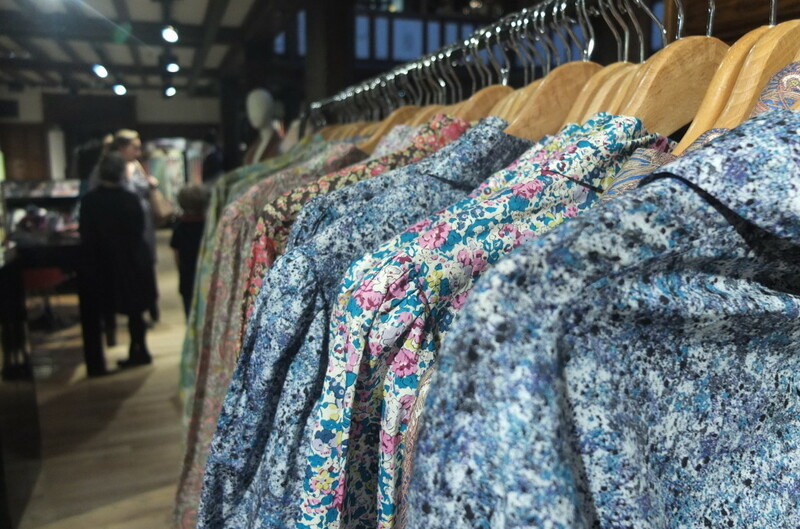 Liberty of London is best known for its famous prints, some dating back to the 19th century. 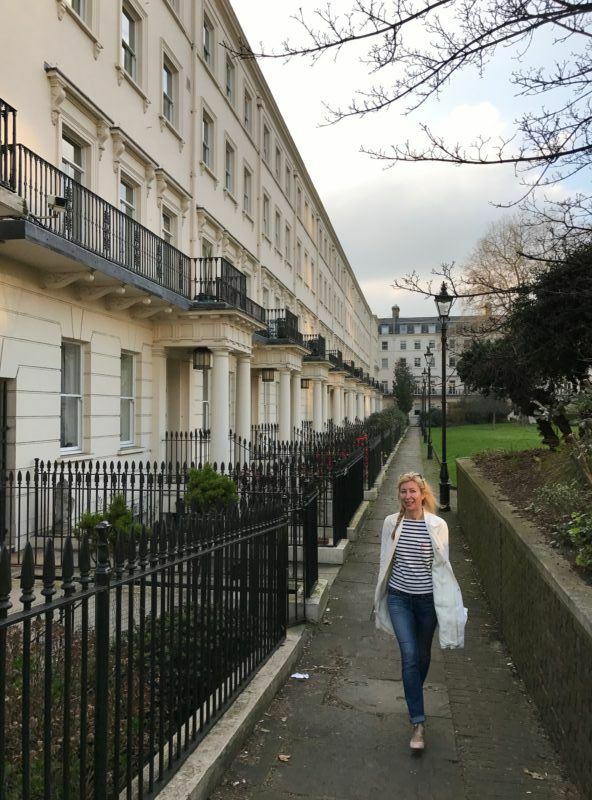 While the prints are found on fabrics and all sorts of housewares and stationary, the classic item is the button down shirt– I bought mine on my first trip to London. For more on Liberty prints and haberdashery, read my dedicated post here. Liberty print shirts are equally popular with men and women. Seeing a football match in England as a tourist allows you to join locals in taking part in a beloved historic tradition, and gives you an inside view of this sport that has become a part of British culture. So get your tickets and join the estimated 900,000 tourists a year who attend British football matches each year. For my full guide to buying tickets and what to expect at a match, read my detailed guide just for tourists here. 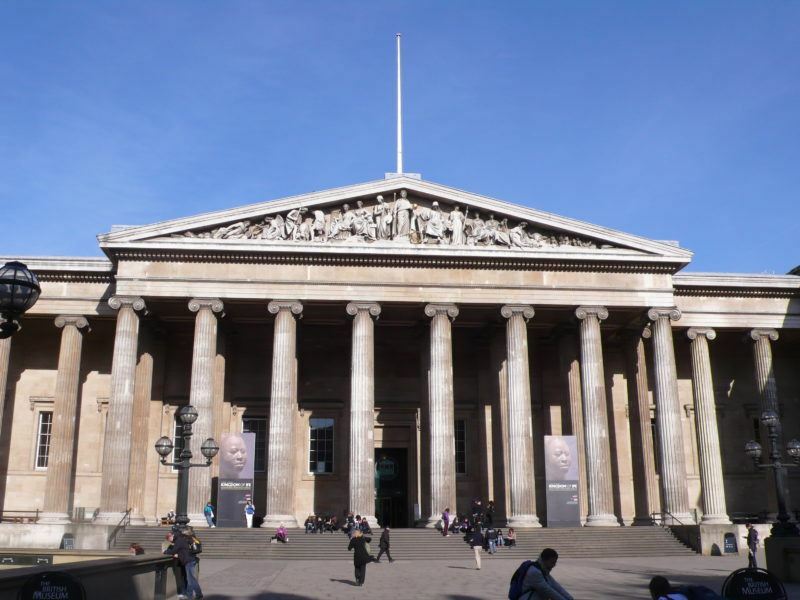 London has so many fantastic museums, most absolutely free, it’s hard to narrow my favorites, but if I must– the British Museum, the Tate Modern, the Natural History Museum and the Victoria and Albert are all well worth the time. Museum gift shops have the absolute best book selections. 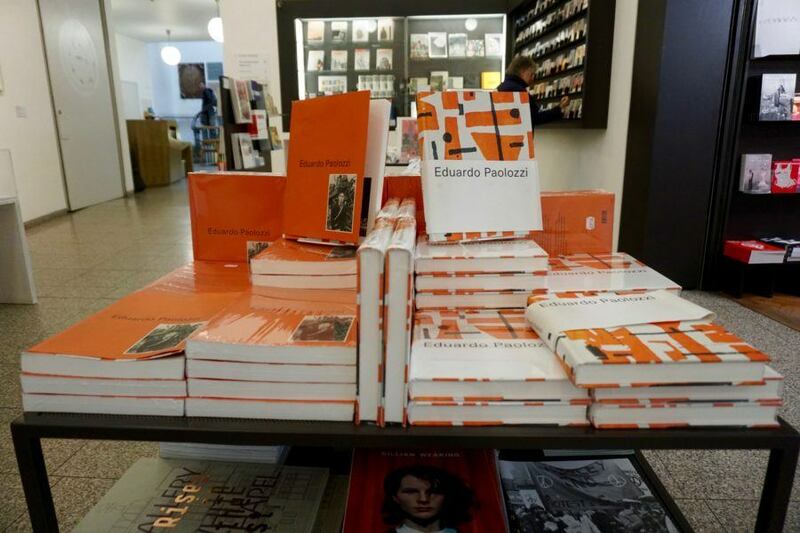 They’re the perfect place to pick up a gorgeous coffee table book highlighting the best of the museum or a book about your favorite artist. 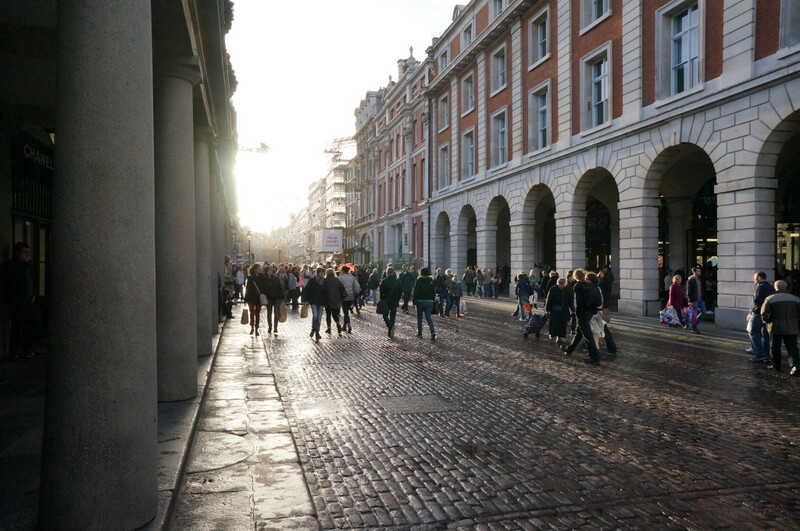 Covent Garden is a central district in London, filled with shops, restaurants and markets. Visit the historic main plaza square to see some incredible street performers– artists have been performing here since the 16th century. There are a few different markets areas in Covent Garden, but the Apple Market is my favorite. The Apple Market requires that all its vendor stalls carry only goods made locally in the UK. Read my review of Apple Market here. 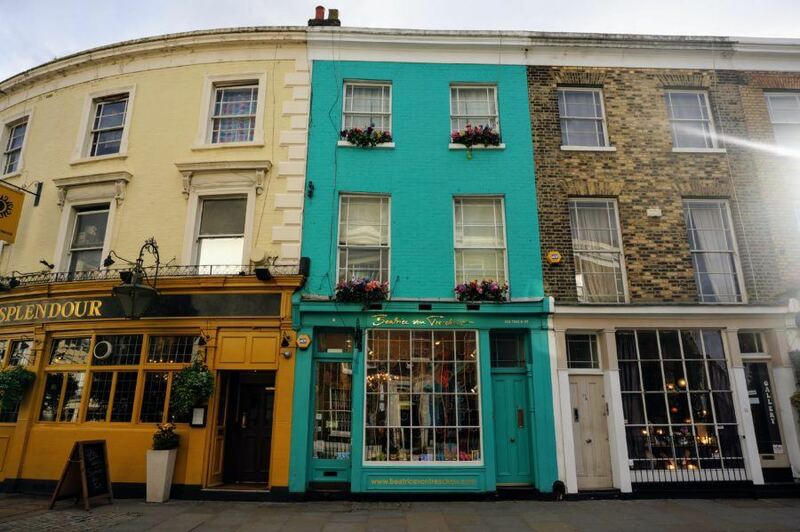 Shopping itself is an experience in London– but it doesn’t have to be posh or expensive. Some of my favorite souvenir finds are on the cheap. For bargains, try two department stores– Primark and Marks & Spencer– and my old standby, any British supermarket. Primark is London’s answer to the discount department store, a cross between the fast fashion of an H&M and the home goods of a Target, with some British whimsy thrown in. Like Target “Tar-zhay”, Primark has even earned its own faux designer moniker– “Primani”. Read my post all about navigating Primark here. While Primark is a great place for cheap fashion, it also has tourist friendly items like souvenir tote bags and other small items. 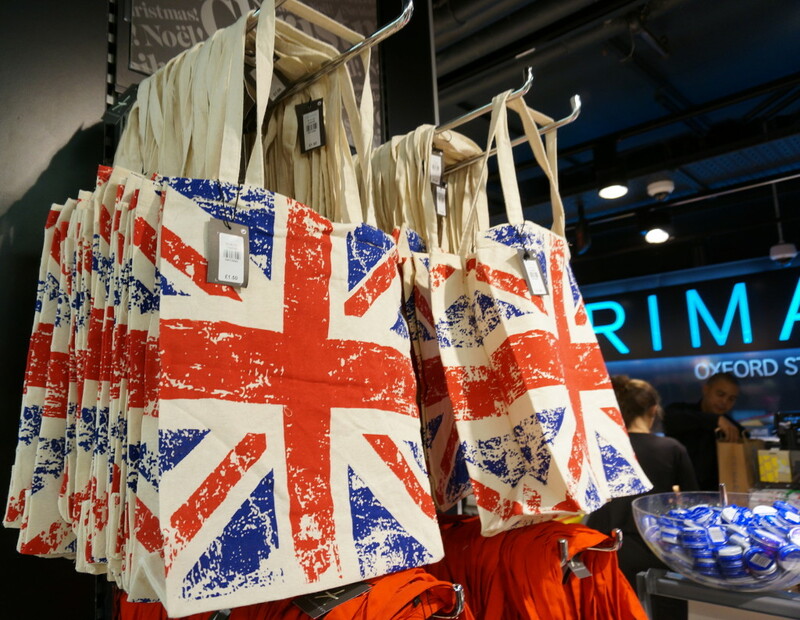 At 1.5 £ each these tote bags are perfect for filling up with British supermarket souvenirs and tea. 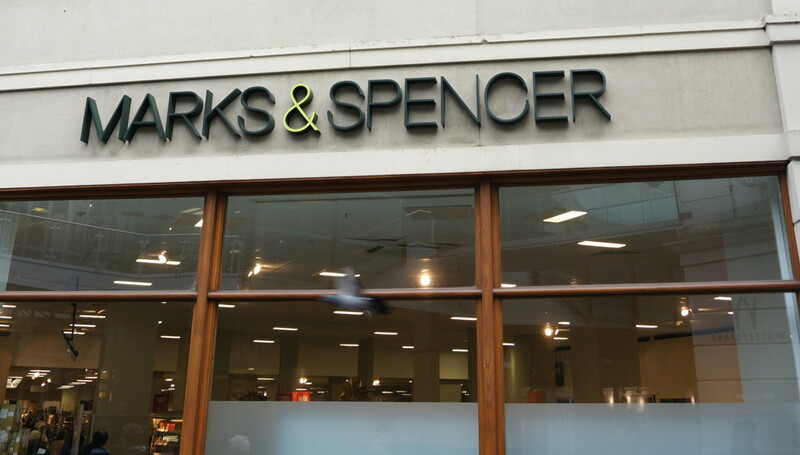 Even posh folks buy their underwear at Marks & Spencer– read my post about this ultimate utilitarian souvenir here. I always come home with a pile of supermarket souvenirs from any country I visit. But when I come to London, I make sure to take a half empty suitcase. 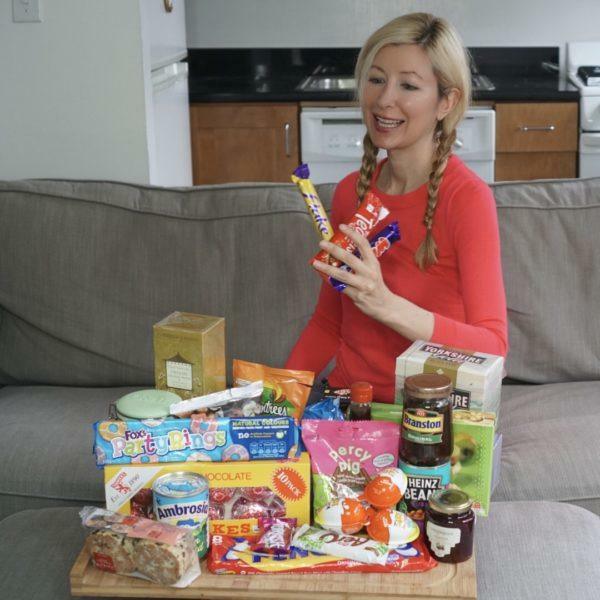 I hit all the British supermarkets– including Tesco, Waitrose, M&S Food (see my Tesco post here). My favorite things to pick up? British chocolate (I’m addicted to Flake and Wispa bars), unusual crisps flavors (prawn cocktail anyone? ), tea, Percy pigs and Branston Pickle. This is part of my supermarket souvenir pile from my latest trip. 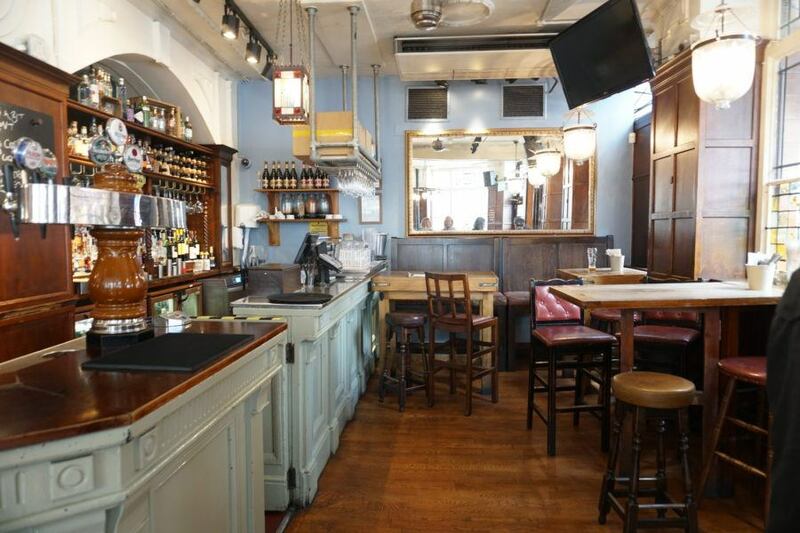 You really can’t go to London without hitting a pub. Or many. No need to plan in advance– just stop in one that looks inviting and you can never go wrong. What to get? A pint of some British ale, naturally and if you’re peckish a traditional meat pie is immensely satisfying. While it’s impossible to replicate the pub atmosphere back home, you can at least make your favorite dishes. Find great cookbooks at any Waterstones bookshop, or seek out Foyles, a still standing independent bookstore that is a pleasure to browse. Fly: I’ve flown British Airways World Traveller Plus a few times now– worth it for the seat recline and stellar service. 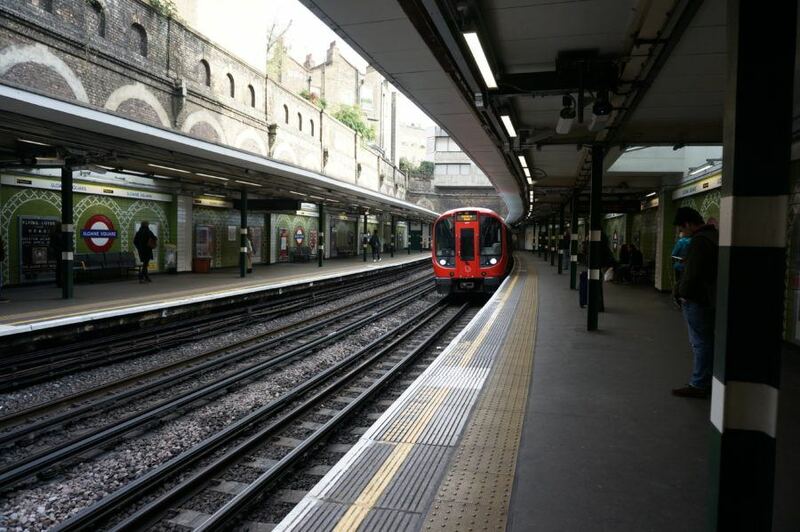 From the Airport: Whether on this trip or my own dime, every single time I come to London I take the Heathrow Express, worth it for the easy, quick trip. 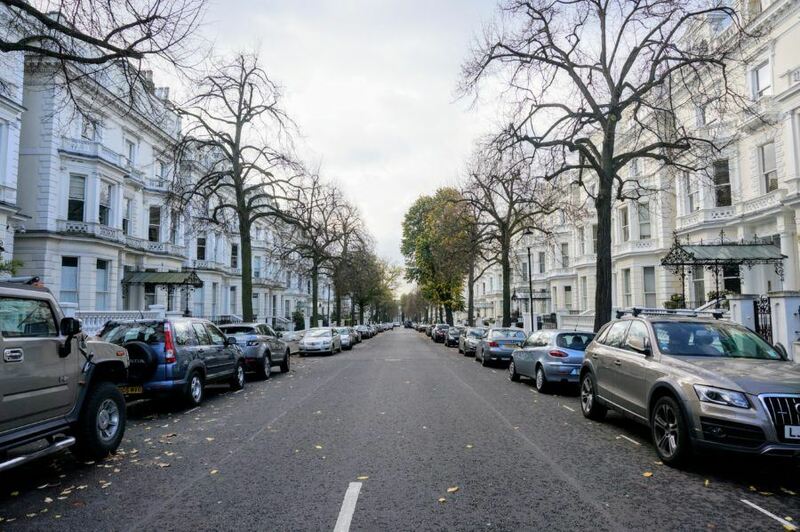 London feels even more like home when you stay in a fully stocked, serviced apartment in a real neighborhood. 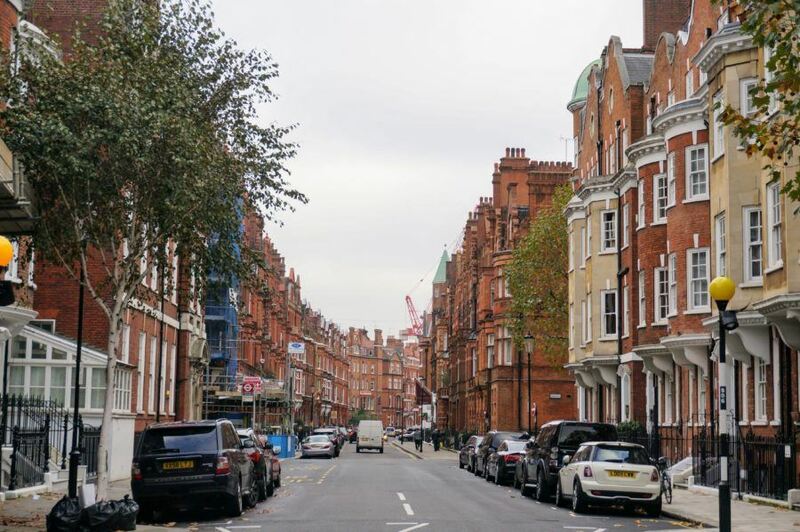 I loved making toast and tea every morning at the Cheval Residences, Phoenix House, then stepping out onto the streets of Chelsea (one of my favorite London neighborhoods). The view from my living room. 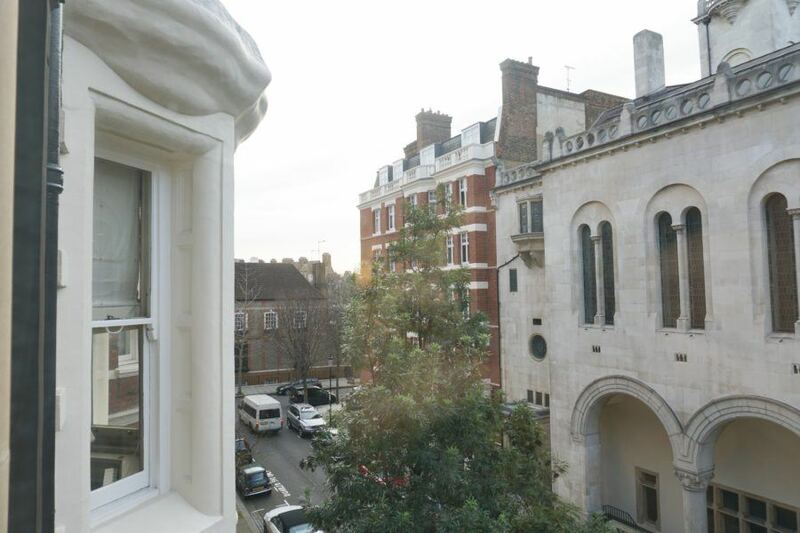 Although I loved the spaciousness of the luxe Cheval apartment, my favorite part was its location tucked away in the fantastic Chelsea neighborhood, just a couple blocks from Sloane Square. For a more fun, hip stay, the Hoxton at Shoreditch can’t be beat. The chic crowd makes you feel instantly cool and the rooms blend comfort with nostalgic touches. For fancier dinners out, don’t miss the best restaurants with a view. Babylon restaurnt at Kensington Gardens and Sky Garden were both top-notch. For pre-theater dining (we saw Noel Coward’s fabulous Half a Sixpence), Inamo in Covent Garden is a fun tech savvy restaurant with delish Asian inspired dishes. For a traditional fish and chips and mushy peas, I’ve been to Rock and Sole Plaice a couple of times now and can confirm it’s just as good as I remembered. 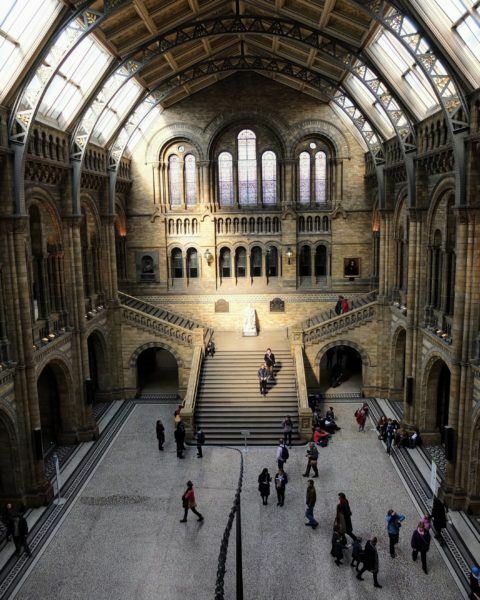 Pick up the London Pass for great discounts and VIP entrance at most of London’s best attractions. 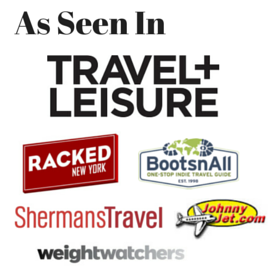 Disclosure: I was a guest of Visit Britain on this latest trip, but all shopping picks and experiences are my own. Remember to pack your souvenir dagger in your checked luggage. Years ago, before 9-11, a friend unthinkingly tried to bring a souvenir knife in her carry-on. Result = no souvenir and a tough time at security. This one has a blunt edge but agree, never worth the risk! 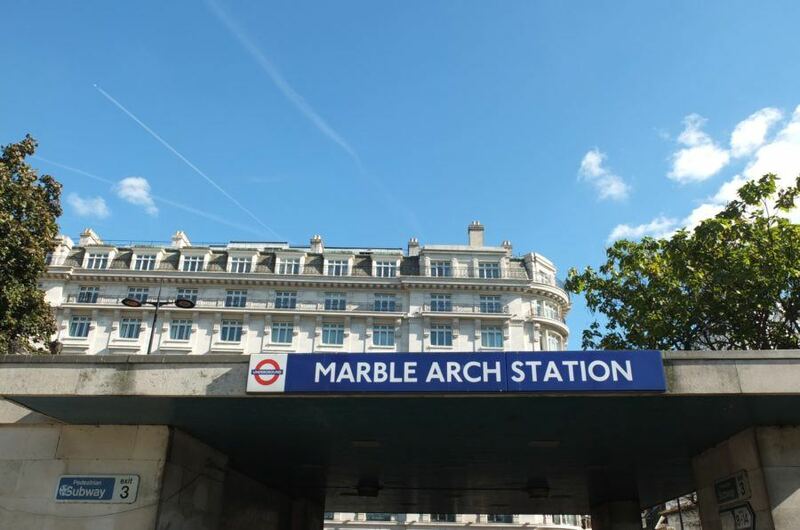 I love London too, and the last time I was there–in October 2014–I stayed at the Doubletree by Hilton-Westminster, which was a few blocks away from one of the Tube stops (I forget which one). The first night I took in the Phantom of the Opera show at the Queen’s Theater on Haymarket Street, preceded by dinner at an Italian restaurant across from the theater–talk about convenience! 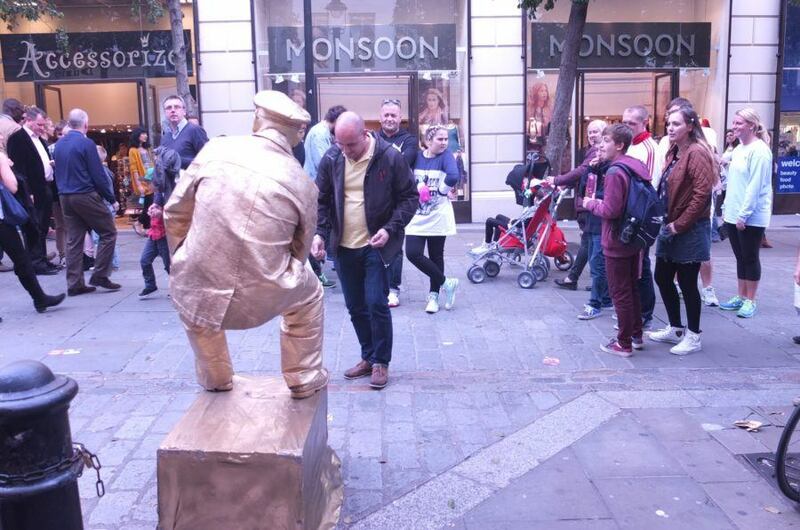 I got there by taking the Tube to Piccadilly Circus, and then walking to the theater area. The next day I did a Hop-On, Hop-Off bus tour using the Big Bus. After the tour, I walked around Oxford Street to find Boots to get some needed toilet kit items. When I was hungry, I found this nice little Belgian waffle stand on a side street. Then I walked back to the Oxford Circus station to return to my hotel. I was exhausted. So what souvenirs did I buy? The only one that counted ended up in my belly! The next day I boarded the bus along w/others to board the Independence of the Seas ship to do a 11-night cruise of Spain and the Canary Islands. Which souvenirs do I like to buy? Magnets and lapel pins because they’re small and inexpensive. Coffee mugs are nice, but they’re heavy to carry around in one’s backpack. Great article, we are heading to the uk this year . 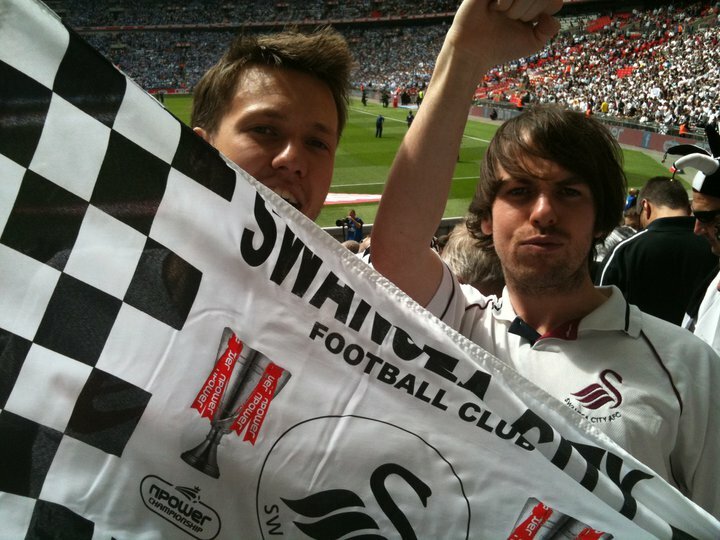 One thing though, if you want London football kit, don’t buy Swansea, they are from Wales. London clubs currently in the premier are Chelsea, Tottenham, Arsenal, West Ham, and Crystal Palace. Yup I have an entire post on the London clubs– that photo was simply better than my others which is why I used it. Haven’t been to Bamburgh but have seen photos and looks amazing! Next trip!